China launched a newgeostationary weather satellite early Tuesday, marking the country's 11thsuccessful space launch of the year and setting a new record for Chinese spaceactivity. The Feng Yun 2E satellite blastedoff aboard a Long March 3A rocket at 0054 GMT (8:54 a.m. local time) fromthe Xichang launch center in southwestern China's Sichuan province. The 172-foot-tall launcherflew east from Xichang and deployed the 3,064-pound spacecraft about 24 minutesafter liftoff, according to the state-owned Xinhua news agency. Feng Yun 2E will join afleet of geostationary weather satellites operated by the China MeteorologicalAdministration. The spacecraft will collect real-time weather imagery forforecasters in China and neighboring countries. The new satellite willreplace Feng Yun 2C, which was launched in 2004 and is stationed along theequator at 105 degrees east longitude. China also operates aconstellation of weather satellites in polar orbit. A new craft was added tothat group during a launch earlier this year. Tuesday's mission was the11th Chinese space launch of the year, breaking the country's previous recordnumber of launches set last year. The launch also pushedChina past the 10successful orbital flights conducted by U.S. expendable launch vehicles in2008. Those missions were flown by Delta 2, Atlas 5, Pegasus and Falcon1 rockets. 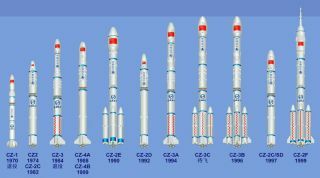 Long March rockets havecompleted 115 launches since China orbited its first satellite in 1970, Xinhuareported.